When it comes to reducing the air flow in your aquarium, the most popular solution is to use an air control valve. But it may surprise you to learn that this valve could be doing your tank more harm than good. So read on to learn more about aquarium airline control valves and, perhaps most importantly, my recommended way of controlling the air flow. An airline control valve is yet another fitting that can be installed on your airline tubing. In its simplest form, a flow control valve is little more than a tube with a screw in it. As you begin to turn the screw, it begins to block off the airline. I would like to add that airline control valves will not completely close, as this would put too much pressure back on your air pump, potentially damaging it. Even when “fully closed,” a small amount of air will still be able to move through the air control valve. Many aquarium air pumps will come with an airline control valve included in the box. This will be the airline control valve that you are most familiar with. Straight valves are commonly available both online and in local fish stores. If you have ever tried to bend plastic airline tubing at 90 degrees (L-shape), you know you will more than likely put a kink in it. Ordinarily you would use an elbow airline connector to get around this problem. Well, an elbow control allows you to both bend the tubing and control the air flow in a single fitting: a 2-in-1 fitting! Airline control valves are also available in a metal design – brass or steel. 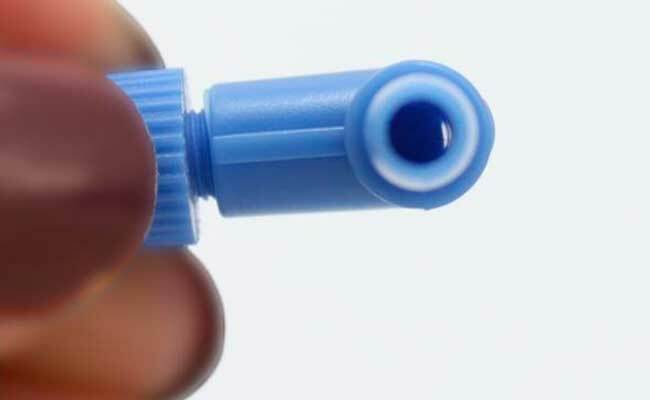 If you do plan to use an airline control valve after reading this article, then I recommend going the plastic route. My experience with metal airline control valves has not been pretty – they are prone to rust and corrosion. 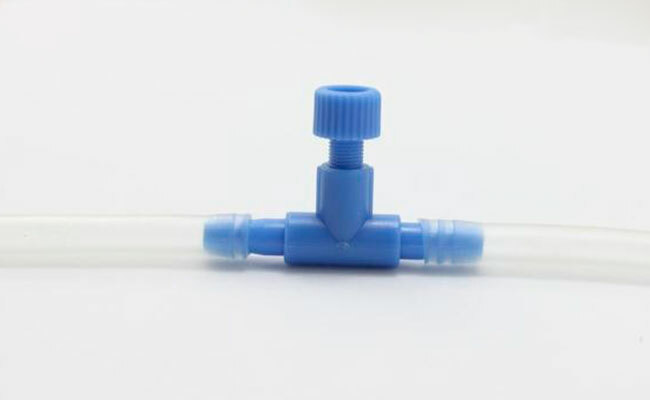 Fishlab Tip If you want to control airflow on two or more air tubes at once, you can use a gang valve – a single airline fitting that can take the place of multiple control valves. Why do you need an air control valve? While fully featured aquarium air pumps are equipped with a built-in flow control knob (called a rheostat), cheaper or battery-operated models do not have the same luxury. 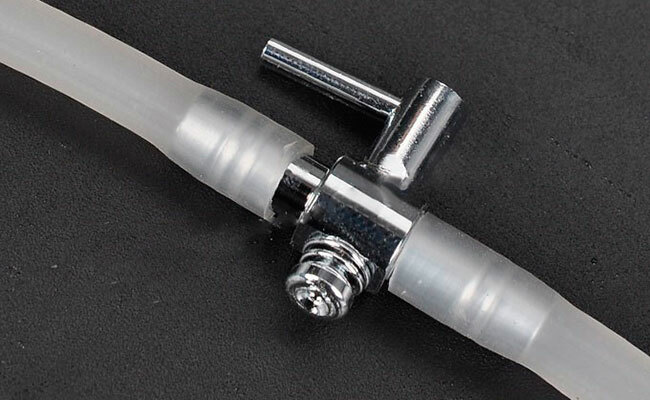 Let’s say that your airstone is producing too many bubbles; you could use a flow control valve to reduce the amount of air flowing through the tubing. Less air reaching your airstone means fewer bubbles. Alternatively, your air-powered sponge filter may be creating a water current that is too strong for your fish – reducing the air flow via the control will slow down the rate at which water is drawn through the filter. Same goes for any other air-powered equipment you use in your aquarium. 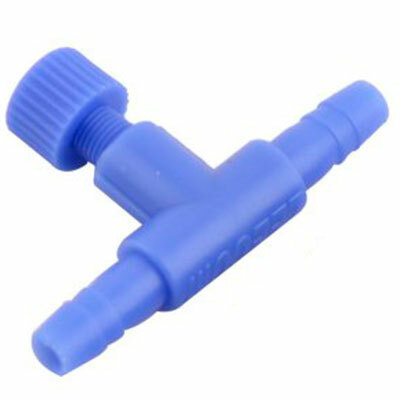 To put it simply, if you need to control the air flow rate on your aquarium, this little valve will be your best friend. There is no arguing that an air control valve is the most popular way to regulate airflow. Many aquarium air pump manufacturers even recommend using an air control valve in their instruction manual. You see, the smaller the hole in the valve, the harder your air pump has to work in order to force air through. 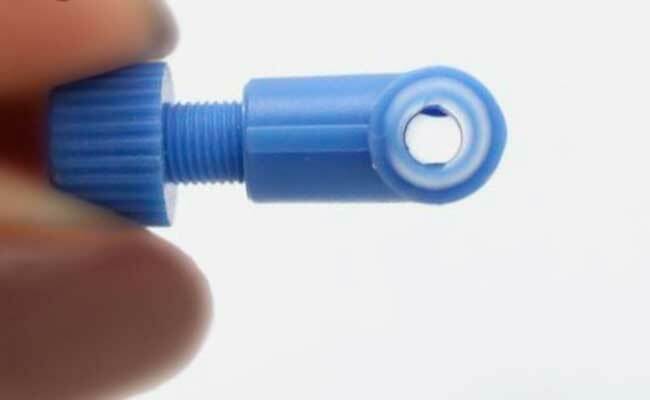 This extra work can seriously reduce the life of your air pump, causing the diaphragm inside to tear prematurely. It is for this reason that many hobbyists use a bleed valve instead. A bleed valve allows you to reduce the airflow without the extra back pressure. If you want your aquarium air pump to last as long as possible, this really is the best way to control the air flow in your aquarium. Want to know more? 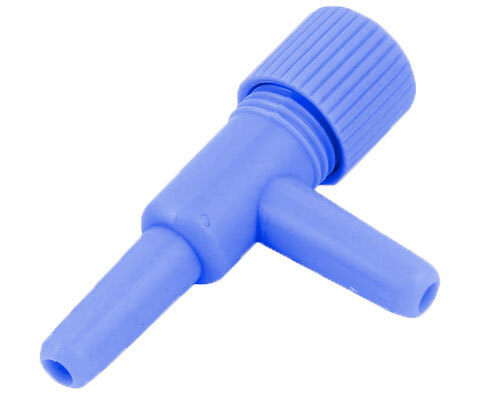 Check out our bleed valve guide. 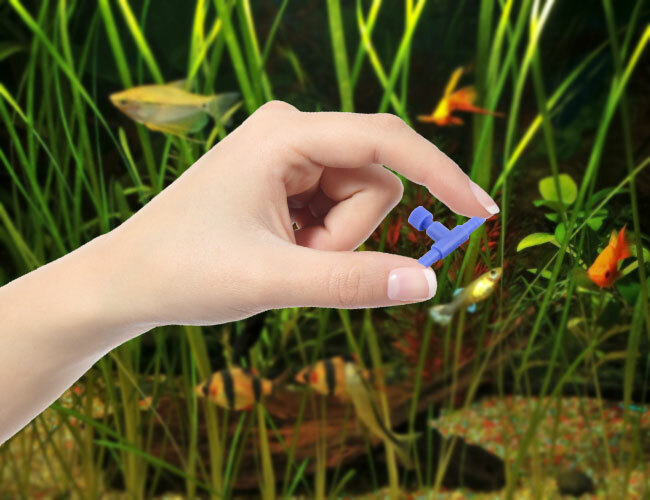 Do you use an air control valve in your aquarium? Let me know in the comments below! We have included links to buy each type of control valve inside the article. Alternatively you should be able to pick them up at your local fish store. Help my thermometer isn’t working. Unfortunately, you will likely have to replace your thermometer. However, you have come to the right place – We have recommended plenty of accurate thermometers in this guide! What you say has some truth however you do not mention why some people use a control valve to direct more air to other air stones. As an example I have a large air pump for my koi pond and I have two air stones in the pond and another for my plant bog. I need much less air in the plant bog so I use a control valve which puts no restriction on the pump. You make a great point. This article is aimed at beginners who are setting up their first aquarium – most experienced hobbyists will already be aware of what an air control valve is and how it functions. The article is not meant to account for every variation in air pump set up, that would be nearly impossible. Over the years I have noticed that, when a beginner sets up their first tank, a single air stone is run from an air pump – there is no other air-driven equipment branching off the air tubing. In this instance a bleed valve is essential. You are correct that branching airline tubing running multiple pieces of equipment might not need a bleed valve. But there are too many variables here for me to list. Lets use your setup as an example: Depending on the power of the air pump, the air stones used and control valve setting, you could still experience back pressure that will place unnecessary wear on your pump.